Where was it that you read that insightful analysis of the latest politico peccadillo? Where did you see that nifty mockup of the Next Great Thing from Apple? We all want to get back to pages we’ve visited on the Web sometimes. It’s easy to find a site that you’ve bookmarked—but what about the ones you breeze through without saving, but later wish you had? Safari 4 provides a myriad of options. Did you close a window too soon? This is especially a pain when you close a multi-tabbed window, losing locations you haven’t even looked at yet. Choose History -> Reopen Last Closed Window to get it back, with all its tabs. Say you must quit Safari to install an update for your favorite utility, but you have multiple windows with multiple tabs open. You don’t have to save all of these pages as bookmarks. Just quit Safari, dismissing any warnings about the opened windows. When you restart your browser, choose History -> Reopen All Windows From Last Session to get everything back to the way it was when you quit. You can access previous pages you’ve viewed in the current window by using the Back and Forward buttons in the toolbar. Speed up this look-at-every-page approach by pressing (clicking and holding) either button instead of just clicking it. You’ll see a menu that lists all the sites in each “direction,” so you can go directly to any page. If you remember the beginning of the address for a previously viewed page, start typing it in Safari’s address field (press Command-L to activate the field). Safari will fill in the URL for the most likely match, changing its suggestions as you continue typing. Start with the name of the site—you don’t need the leading http://. For instance, when I type da in the field, Safari suggests daringfireball.net. One way to find a page you've visited is to let Safari's address field make a suggestion. Here I typed only a couple of letters and Safari did the rest. As a bonus, you get a drop-down menu from the field with other matches based on your history and bookmarks. You just closed a tab by mistake. No problem. Every page you’ve visited in the last week or so is in the History menu or its submenus, conveniently listed by the usually descriptive page name defined by the site’s designer rather than by some gobbledygook URL. In all likelihood, you’ll find your Web page listed in the main menu. Perhaps an item you need is too old to be listed in the History menu. Or perhaps you have no idea what the name of the page was. What you do know is that this page had Oscar Wilde’s purported deathbed quote (“My wallpaper and I are fighting a duel to the death. One or other of us has to go”) on it. No problem. You can search through URLs, page names, and, best of all, the contents of pages you’ve visited. Go to Top Sites and click in the search field in the lower right of the window. Then type, for instance, wallpaper duel. You’ll get a cover flow view of any page in your entire browsing history that includes those words; click on a preview to go to the site. The Bookmarks window keeps track of more than just the places you’ve bookmarked: It tracks your entire browsing history. To search for Wilde’s immortal words from the Bookmark window, Choose Bookmarks -> Show All Bookmarks (or press Command-Option-B, or click on the book icon in the Bookmarks bar). In the Bookmarks window, click on History in the sidebar (it’s the first entry under “Collections”), and then type wallpaper duel in the search field in the upper right of the window. Go to a found page by clicking on its preview in the cover flow area; or, in the list area, double-click on it or select it and press the spacebar. Bonus tip: You can control how much history Safari remembers for you—whether you want it to remember only a day’s worth, or a year’s worth, of sites (or everything until you manually erase the history). 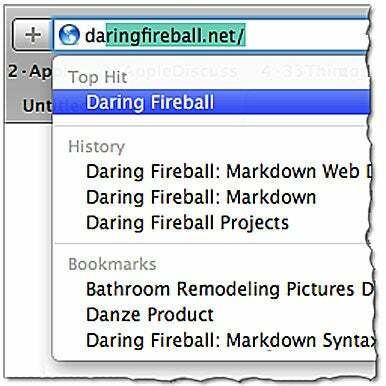 Choose Safari -> Preferences, and in the General pane, set your history length in the Remove History Items menu. 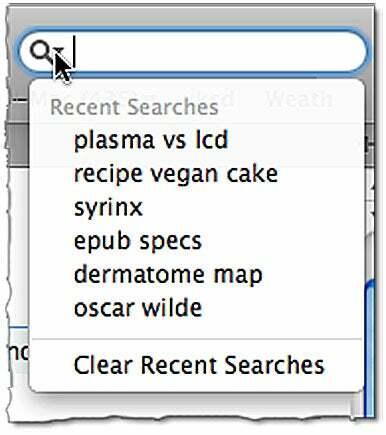 Click on the magnifying glass in Safari’s Google search field to see a list of the terms you’ve recently used there. If you want to return to a page you went to as a result of a successful search from the Google search field, click the magnifying glass in the search field to get a list of your recent searches. Select the one you used the last time to see the Google suggestions again. A search from Safari’s convenient Google search field provided a long list of promising hits on the Google results page. You click on one, and then click a link on that page, and then another link…and eventually reach a dead end in your search. To get back to the results page quickly, just click on the orange SnapBack button in the Google search field. The search field in an application’s Help menu lets you find things listed in the program's other menus. Many of the places you’ve been in Safari are listed in its History and Bookmarks menus. Put these two facts together, and it means you can type part of a Web page’s name into Safari’s Help menu search field to easily find a page that is listed in either menu, or even in the History menu’s submenus. See this article for more details. Sharon Zardetto’s most recent book is Take Control of Safari 4.